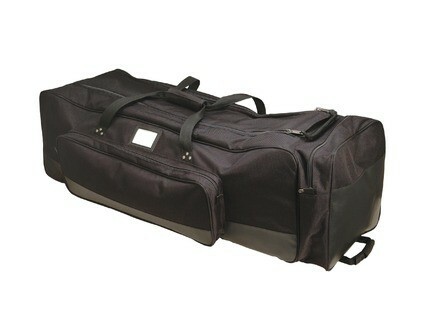 DHB6500 Drum Hardware Bag, Bag/Gig-Bag from DrumFire. The DHB6500 is designed to make the transportation and storage of heavy cymbal stands, thrones, clamps, and other drum accessories as easy as possible. The DHB6500 is intended for professional and amateur players who require a high level of protection for their cymbal stands. Constructed of a heavy, durable, and water resistant nylon exterior, according to DrumFire, the DHB6500 incorporates a foam-lined interior to protect the contents while preventing stands from piercing its sidewalls. The bottom of the DHB6500 is rigid, supported by an incorporated handcart trolley featuring two recessed rollerblade-style wheels. Two heavy-duty handles allow the DHB6500 to be carried when rolling in not an option. The interior is accessed through a double zipper pull, allowing for one-handed placement and retrieval of folded stands, while a removable vinyl compartment divider keeps contents organized. The DHB6500 features 2 external accessories compartments, one sized to hold sticks, beaters, drum keys, etc., the other sized to store a standard drum throne seat. Measuring 40" L x 30" W x 12.5" D, the DHB6500 is supposedly large enough to hold up to 8 pieces of hardware, plus accessories and a drum throne seat. Check out www.musicpeopleinc.com for more info. Lil Namba Remix Backpack Namba Gear announces their 2nd high performance laptop backpack for musicians and DJs. 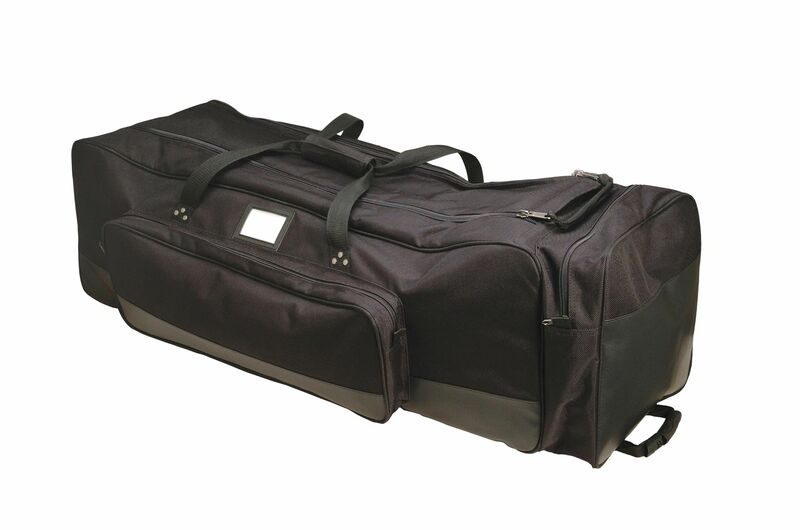 Kaces Jumbo Stick Bag This new bag is designed offer multiple storage compartments for drum sticks and almost everything else. [Musikmesse] PREMIUM PR:O Covers The new protective covers for the PREMIUM PR:O series are made from sturdy synthetics to protect the cabs from scratches and offer protection during rainy outdoor events.